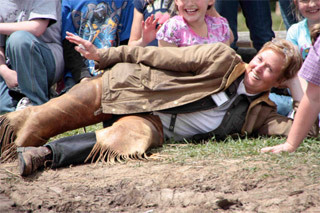 So reads a letter from Carol Hamilton, a rancher from Uinta County, Wyoming who spent most of last year corresponding with the third graders of nearby Fort Bridger elementary school. This letter exchange between the Hamiltons and the students was part of a first-of-its-kind “Adopt-a-Rancher” program established by Dannette Edelmayer and Kerri Sabey of the Uinta County Conservation District. Written as if she were talking to one of her grandkids, Carol Hamilton’s letters are an extraordinary paeon to life on a ranch. She believes the real value in this program is that by the end of the year, there were 64 kids with a personal relationship to the ranch. When they’re grown, she says, if people try to manipulate their perceptions about ranching, they’ll have some experience against which to judge that message. 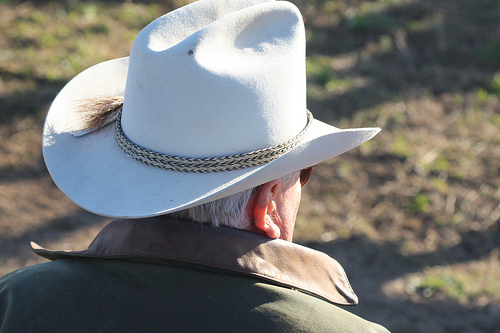 She laments that ranchers have been experiencing a negative perception problem since the early 1970s, which in her experience is largely based on ignorance. This echoes my own thoughts. Last year I made a speech to the Public Lands Council and emphasized the need to develop a public relations campaign that restores ranchers to their rightful position as our premier rural stewards of the American west. That’s a tall order, since, as Carol has noted, ranchers are generally perceived as modern day ecological villains and landscape abusers. How do we turn today’s “Black Hats” into resuscitated White Hats, resurrecting the public image of Shane, Bonanza, and the Lone Ranger? Our answer at PLN is to empower individuals with intelligent information, cutting out the middlemen whenever possible. like that of Carol’s own ranch. She and her husband, Richard, have been working with BLM and other ranchers using Cooperative Resource Management since 1994. They’ve used deferred rotation grazing, sagebrush manipulation, and created new upland reservoirs to achieve outstanding health of the range and support wildlife such as antelope, elk, and sage grouse. 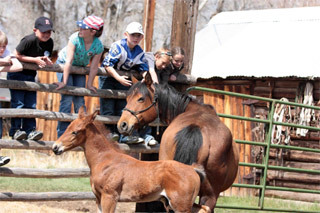 Adopt-a-Rancher culminated this past spring with a ranch visit for more than 60 kids. With the help of 22 neighbors, Carol organized introductions to the Hamilton’s own menagerie, as well as ewes, lambs, mares, colts, goats, and jackasses from neighboring ranches. The kids learned about cattle identification, cow by-products, and western wear, and they got to ride saddle horses and backhoes. As Carol said in one of her letters about the end of fall roundup, “Someone always brings good hot food and dessert. This is the best part of the day. Sounds to me like happiness for a human. Thank you for this note about Carol and her school PR work. Great idea. More and more blogs are trying to communicate, too, although perhaps without intended, specific audiences. I want to offer California's Grazing for Change, editions 1 & 2 as a source for these stories. They're peer reviewed in the sense that FWS or NRCS or others are part of the conservation projects. Contact: Tracy Schohr, CA Rangeland Conservation Coalition, 916.444-2194 (CA Cattlemen's office). Thank you also for PLN.